Redbox has a promotion going on from now through Valentine’s Day with free DVD rentals that Facebookers can give to their FB friends. The promo code provided with the Valentine is only good for use at Redbox kiosks. Tt can’t be used for movies reserved online. And it is only for use on Valentine’s Day, Tuesday, February 14. The code expires at midnight, Central Time, on Valentine’s Day. Facebook users can send the Redbox Valentine with the free promo code at no cost through the Redbox app, and the Valentines can sent to as many friends as they wish. 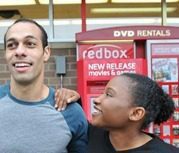 The sender does not get a free rental for sending a Redbox Valentine – however, Redbox suggests getting a friend to return the favor and send a Redbox Valentine back. Unfortunately, there is not a way to send someone a Redbox Valentine if the receiver is not a Facebook user. Ariel is a full-time university student currently studying English and Business. Ariel loves to write about electronics, fashion, and entertainment news, and is currently in the process of writing a preteen horror novel.